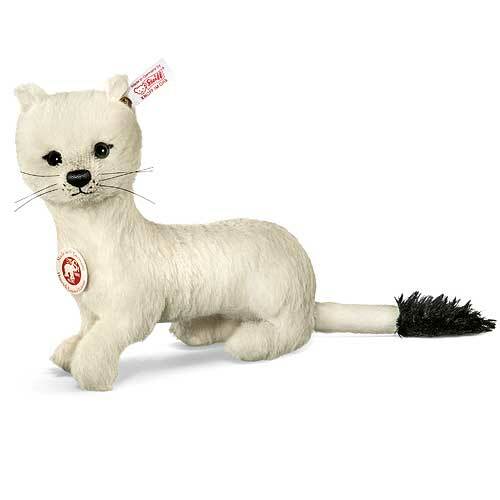 Our Steiff Heinrich Ermine is single jointed (head) and made of the finest white alpaca. This beautiful piece wears the famous gold plated Steiff button in ear and is a limited edition of only 1500 pieces worldwide. Product details: safety eyes, synthetic filling material, non growler, total size 23cm. Comes boxed, together with a certificate of authenticity. The fur of the exquisite ermine has long graced the robes of state with its brilliant whiteness. The ermine is a perpetual symbol of royalty - adding elegance to coronation robes and the great affairs of court. 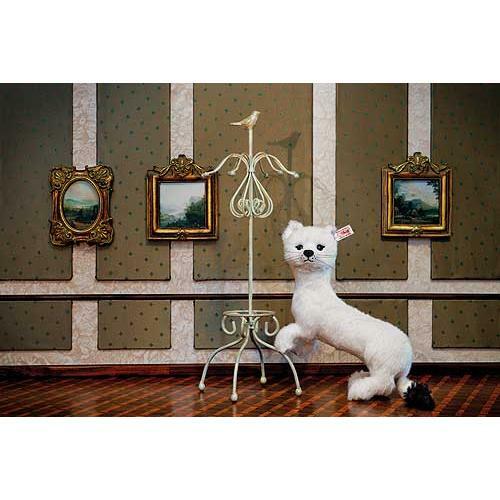 The body of our Heinrich ermine is sewn from snowy white alpaca. His tail is tipped with black alpaca and his eyes, nose, and whiskers are also pure black. Heinrich is definitely a noble creature. He is certain to add an air of royal sophistication to your collection.